Got a New Year's resolution? If you don't have anything in mind, don't panic! In 2018, resolve to drive sober. To start your resolution off on the right foot, make sure your New Year's Eve plans include a safe way home. Whether that's a designated driver, using a ride-sharing service like Uber, or making arrangements to stay overnight somewhere, there are many options to avoid drinking and driving. You can also use the SaferRide app developed by the National Highway Traffic Safety Administration. Use it to call a taxi or a friend by identifying your location so you can be picked up. Last year, between Dec. 30 and Jan. 2, Pennsylvania saw nearly 900 crashes and 12 fatalities where alcohol was a factor. Besides killing or injuring someone in a crash, drinking and driving comes with the serious consequence of a DUI offense, which can result in costly fines, court appearances, community service requirements, possible job loss, and even jailtime. Pennsylvania has set .08 percent BAC as the legal limit for a DUI conviction, but impaired driving enforcement covers more than just alcohol — Pennsylvania law enforcement also work to identify drivers impaired by drugs and/or prescription medications. In general, it takes about one hour for an average person's body to eliminate one standard-size drink, including that glass of champagne you may down when the big ball drops. But keep in mind, impairment begins with the first drink, so before heading out the door, make sure you have a safe way home and encourage your friends to do the same. As with other resolutions, by the time March rolls around, the gyms are far less crowded and most, if not all of those promises to eat healthier and work out more are broken. 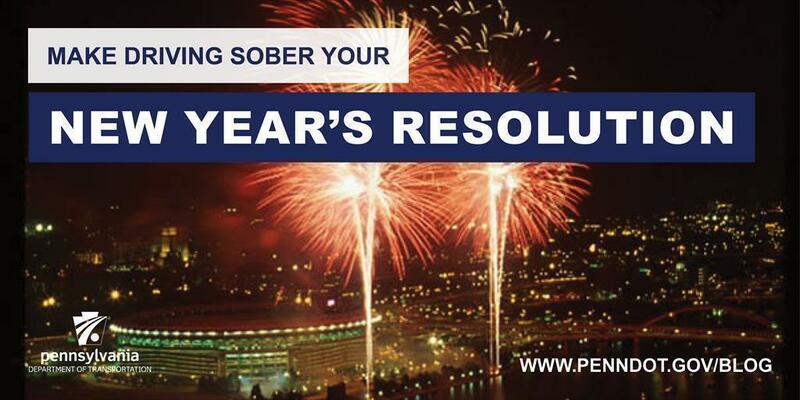 Driving sober, however, is one resolution you really can’t afford to break. For more information on driving safely throughout the year, visit www.penndot.gov/safety. Follow us on social media — Facebook, Twitter, and Instagram.